After a successful opening year in 2018, the BRSCC Mazda MX-5 Super Series headed into 2019 with the premise of more drivers and more new faces appearing on the grid. Thankfully, the opening rounds at Brands Hatch in Kent didn’t disappoint as 23 drivers made up the entry list, the biggest the series has accumulated to this date. All in all, everyone was excited to kick off a new year of racing and what followed was nothing short of energetic to say the least. Saturday’s qualifying session saw the first pole position of the year going the way of James Kell, who was using the Super Series to dovetail his full season commitments racing in the Michelin Ginetta GT4 SuperCup this season. Simon Fleet managed an impressive 2nd fastest time to line up on the front row for the first race, while Sam Bailey and Xavier Brooke also put in quick times to take up the second row. Rookie driver Joseph Marshall-Birks set the 5th fastest time from Alex Miller and Bradley Kent, with the top 10 completed by Jeremy Crook, young karting graduate Declan Lee and Mk1 convert Clive Powles. The season was barely a corner old at the start of Race 1 when the fireworks began in earnest. Sam Bailey lost the back end of his car at the bottom of the hill and while most drivers were able to avoid him, a hapless Declan Lee was not so fortunate as collected the stranded car of Bailey. Both cars were unable to continue competing for the rest of the weekend, but with enough time between then and the second race of the weekend the following day, both drivers were able to source new cars that would get them back on the grid on Sunday. The race was immediately stopped to clear the incident and once racing was able to resume on the second start, Kell picked up where he’d left off on the first start and made a clean break at the head of the field. From start to finish, his lead was untouched and he was able to push it out as far as 4.5 seconds before easing off a little in the final laps to bring the car home. As it was, Kell crossed the line to take a fine victory, his first in the Super Series and one he hopes is the first of many. Behind him came one of the rivalries of the weekend as Fleet and Marshall-Birks did battle in a fierce duel for 2nd place. Fleet took advantage early as Marshall-Birks had to get around Bradley Kent for 3rd which he eventually managed after a handful of laps. Despite pushing hard and applying pressure once he’d caught up to the #21, Fleet kept his cool to score his best ever result at the wheel of a Mazda with 2nd place. Marshall-Birks wasn’t too displeased with 3rd place either as this would be his best result of the weekend so far. Clive Powles picked up 4th place ahead of Jeremy Crook in 5th, with Matt Pickford and George Grant collecting 6th and 7th respectively. Former FunCup racer Chris Webster was 8th from rally driver Dale Crowsley in 9th, while Cameron Thompson made a respectable return to the wheel of a Mazda as he completed the top 10 in 10th place. Sunday morning saw the return of two very familiar Mk3 MX-5s to the paddock. Declan Lee had loaned the use of Joshua Jackson’s multiple race winning car to contest the day’s races, while Sam Bailey had collected son Jake’s Super Series race car, also taking a change of number to #14 to reflect the digits the car was already wearing. Alongside new cars also came a brand new driver, as Sunday’s entry was bolstered by former British Rallycross champion Nathan Heathcote as he competed in the quest for licence signatures. Nathan has elected this season to move into circuit racing and has chosen the Ginetta GT4 SuperCup, like James Kell, as his full season commitment. He would start at the back of the grid with his true pace something of an unknown. With James Kell on pole again for Race 2, once again there was drama in the opening corners as Matt Pickford was tipped sideways by Cam Thompson, sending more cars scattering through the gravel in avoidance, with Jim Hart also becoming a casualty as a result. The Safety Car was called once again but it was fortunes after the restart that caused the biggest shock. James Kell had once again sprinted off into the lead, but just a few laps later it all came to a sudden halt. Kell lost the car on the exit of Paddock Hill Bend, spearing into the inside barrier on the run to Druids and crashing out of the lead. The race was immediately stopped to recover James’ stricken car, which would take no further part in the weekend’s activities, as well as check for and repair any barrier damage. Once racing was able to get underway again a short while later, Fleet jumped into the lead as the loan front row man thanks to Kell’s demise, but was quickly closed in again by that man Marshall-Birks. The #99 took the lead on Lap 4 of the restarted race but Fleet made sure he wasn’t getting away that easy. What the pair hadn’t counted on was the storming progress of Sam Bailey, who was making good use of son Jake’s Mk3 to pick his way through the pack with apparent ease. From the restart, Bailey only needed four laps to move into 4th place, with 3rd placed Jeremy Crook capitulating a lap later to push Sam into a podium place. Despite spending the remainder of the race cutting into the gap ahead to the leading pair, Bailey simply ran out of time and laps to make a challenge and ended up just 1.5 seconds away from the leader at the flag. Of the leading pair, the win would end up going to the #99 of Marshall-Birks who put in a superb effort to clinch his first Mazda MX-5 win. Fleet may have missed out on the win but was still delighted with another 2nd place trophy, while Bailey was just happy to finish unscathed as well as deliver a determined performance to wind up on the rostrum. Behind the podium places Bradley Kent would also score a personal best 4th place, but arguably the most impressive drive of all came from Nathan Heathcote who clawed his way from the back to finish a staggering 5th place. George Grant was 6th ahead of Alex Miller in 7th place, followed by Clive Powles, Jake Swann-Dixon and Darren Kell in the remainder of the top 10. Moving into the third and final race of the weekend, there was much anticipation as to who may come out on top with the victory. Given that James Kell was side-lined for this race due to his Race 2 incident, it was thought that any of the top 5 starters could be in contention for the win, even Nathan Heathcote who, remember, was only there to gain signatures! Nevertheless, the opening two laps would end up providing the answer. From pole courtesy of his Race 2 win Marshall-Birks held onto the lead on the opening lap, but it was the rocket start for Heathcote that caught many spectators’ attention as he leaped from 5th to 2nd and immediately made designs for the lead by the end of Lap 1. The next time past the start/finish line, Heathcote had not only taken 1st place but then proceeded to extend the gap to the cars behind to as much as 2.5 seconds at one point. In 2nd place, Bailey had made full use of his higher starting spot this time to lead the charge after Heathcote, but he quickly became embroiled in a battle with Bradley Kent which he temporarily lost out on midway through the race before reclaiming it back a couple of laps later. However with the final few laps in sight, Bailey entered Surtees corner a little too hot and ended up careering off the road and across the grass before he gave the barriers a nudge and continued on; the spin had dropped him all the way down to 14th place. Come the end of the race, which was flagged a couple of minutes earlier than the scheduled 20 minutes due to time constraints, it was Nathan Heathcote who took a sensational first circuit racing victory and therefore justifying his switched from mixed surfaces to asphalt. Bradley Kent was the main benefactor from Bailey’s spin as he kept his cool to take an excellent 2nd place for Essex & Kent Motorsport, followed by yet another podium finish for Simon Fleet as he made it three trophies from three races with 3rd place. Marshall-Birks faded a little in this race but still scored a solid 4th place ahead of what was certain to be a personal best for Alex Miller in 5th, ahead of Boreham Motorsport teammate Xavier Brooke in 6th. Russ Lindsay and Jeremy Crook took 7th and 8th respectively, with Dale Crowsley and Jake Swann-Dixon completing the final top 10 of the weekend. Amusingly, Heathcote didn’t even stop to get out of his car after his win as he drove straight round to the assembly area to line up for the subsequent Track Attack Race Club race that was taking place straight after Race 3 had finished! Nevertheless, Nathan should now be suitably prepared for his Ginetta GT4 SuperCup campaign and he’ll even have James Kell and MX-5 SuperCup graduate Carl Garnett to keep him on track too. Fingers crossed that this isn’t the one and only time Nathan takes to the wheel of an MX-5 as we’d love to have him back on the grid! 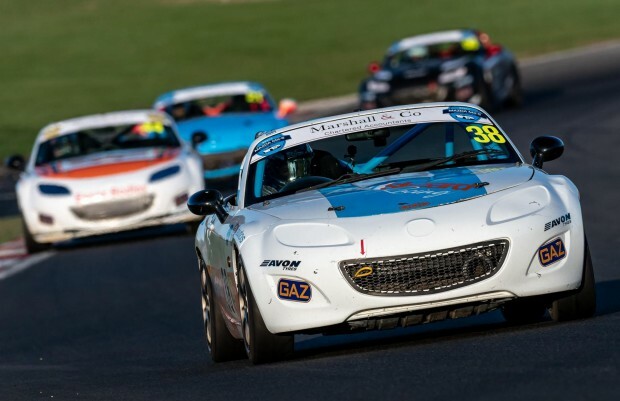 The next rounds of the 2019 MX-5 Super Series take places at a new venue, with Pembrey in South Wales hosting Rounds 4, 5 & 6 on April 20/21. Even though this is a non-points-scoring series, that doesn’t mean the racing is any less entertaining or intense. Next time out will definitely be a testament to that.